I was a whirlwind of emotions while watching “Ready Player One” but the main one I felt was relief. I was relieved Steven Spielberg, one of the most successful and entertaining directors in movie history, hasn’t lost his touch. I was beginning to worry. He’s made some very fine films in the past few years. But none of them were overwhelmingly fun. Even though I don’t hate his fourth attempt at an Indiana Jones movie, I’d say his last truly great action or adventure film is easily “War of the Worlds” and before that “Minority Report.” But that’s only two great, flat-out entertaining adventures in fifteen years. That’s not quite an impressive recent track record for one of the best directors in town. 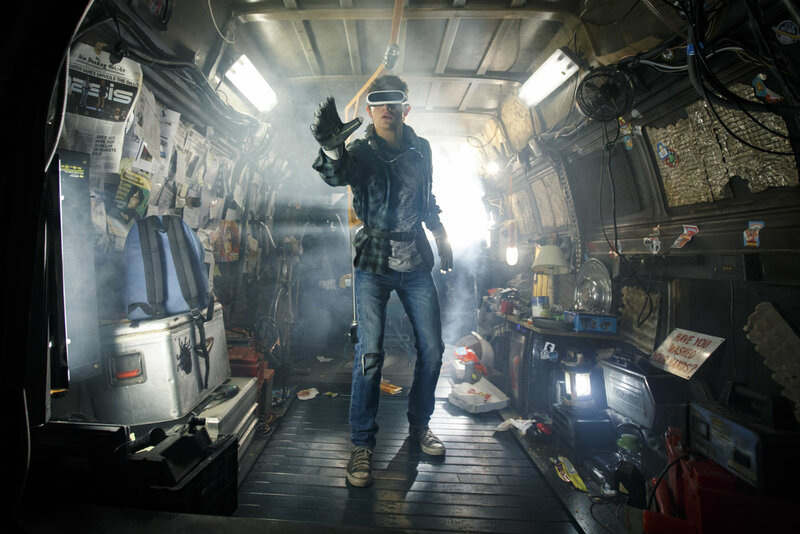 I’m ecstatic to report that “Ready Player One” is Spielberg’s most entertaining movie in over a decade and still shows that the brilliant septuagenarian hasn’t lost his magic touch for creating charming worlds, heart-stopping set pieces, and a fascinating sense of wonder. It’s Spielberg at his most Spielbergian. Let’s be honest. Did anyone actually think that it was possible to get so emotionally invested in characters who spend a majority of a movie’s runtime in a virtual reality world? I mean what are the stakes of a video game really? The film does a tremendous job setting up the story and why I felt so connected to a world that was so obviously disconnected from each other. In “Ready Player One” it is 2045 and the world is a desolate place with slum-like major cities. Most people “escape” their harsh reality by slipping into the OASIS, a crazy powerful virtual reality world created by an eccentric Steve Jobs/Bill Gates guy named James Halliday (Mark Rylance). The guy has passed away and in true Willy Wonka form has hidden an “Easter egg” and the player who finds it will win complete control of the OASIS. If that plotline sounds sort of Goonies-ish you’re not crazy. Our protagonist is teenager Wade Watts (Tye Sheriden). He lives in the slums of Columbus, Ohio and teams up with a few others to help find the hidden egg. It turns out that Halliday programmed three challenges in the OASIS and which would in turn lead the winners closer to the hidden egg. Watts, spending most of his time controlling his OASIS avatar Parzival, meets Art3mis (Olivia Cooke) whose also trying to find the egg. They team up with a few others to find the egg before the evil Nolan Sorrento (Ben Mendelsohn) CEO of the Innovate Online Industries corporation and his enslaved minions can find it. Sure the plot is somewhat deceptively simple: good guys must find the treasure before the bad guys do, but it’s an incredibly tense and fun adventure. But really, I’m burying the lead. You know what’s so great about “Ready Player One?” It’s a love letter to all things nostalgia. We’re talking pop culture overload here. Movies, video games, you name it. Wade drives around in the OASIS in a DeLorean time machine for crying out loud. The first challenge involves a driving race and you could go cross-eyed trying to identify all the different recognizable vehicles. There’s even an entire scene that takes place inside an entirely different movie. It’s a jaw-dropping sequence and a major treat for cinema nerds. Sure the film caters to those of us who grew up in the 70s, 80s, and 90s, but I’m pretty sure 95% of anyone excited for a Spielberg film is someone who lived through those decades. It’s not so much a movie about the love of nostalgia itself, it’s a movie about the love art and entertainment.